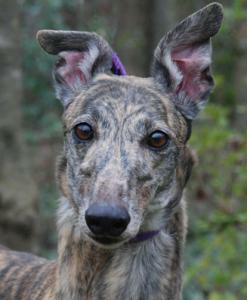 Kimmie is a brood that just arrived from a greyhound breeding faciliity in the Jacksonville Fl area. She is a daughter of the famous Dodgem By Design and is 7 years old. DOB June 24, 2004. She raced at 62 lbs and is a beautiful, brindle girl that doesn't look her age and doesn't have much white on her face yet. For whatever reason she didn't actually ever end up having puppies and didn't actually have much of a racing career either because of a broken hock early in her career. The hock is totally healed and you can't even see where it was broken now. She is very friendly, happy and loving with people. Kimmie passed her cat and small dog testing and has been fine with a small dog in her foster home after an initial sniff. She loves to play with stuffed toys that squeak and stole stuffed toy football of the shelf at Petco and laid on a bed squeaking it and playing with it for much of the day. She was a huge hit at her first meet and greet at Petco going up to kids and grownups for love. She is a confident girl that wasn't phased in the least by all the people, dogs and attention. She is a fun girl that would be another that would probably excel as a Therapy Dog.